Never on Ebay/Paypal side typically(ever) but in this case you had bad apples selling a $100 item for a penny with $99.99 in shipping, what were they to do? Hawk is correct. They are charging a fee for a service they do not provide. 'what were they to do?' - they should have spent some of their ill-gotten gains on policing the site. Instead it's 'let's charge fees on shipping, blame the shipping gougers' whilst raking it in even more. I do hope one day, they will have to refund all those unethical/illegal fees. Part of the reason I stopped listing in September was because of all these new fees and price increases. Airlines charge for middle seats now. It's the way of things. It will backfire on these greedy companies. Historically, constant price increases have not been the answer. The consumer will push back. Just look at the recent housing market report. Look at FedEx's profit outlook. Look at how many good sellers have left ebay. America is no longer a country. It's a business. Why not complain about the rest of the sites that charge a fee on shipping? There are many as it is certainly not limited to Ebay and Etsy. How about Amazon and PayPal? And I'm sure there are others. "eBay Charging Sellers 25% or MORE Soon??? on YT." ebay think that raising pricing on everything will satisfy the stockholders. eBay management need to take a good look in the mirror. Constantly raising prices on fees, shipping, etc. is an unsustainable business model. Too many straws will break a camel's back. Poshmark has a great business model. Yes, their 20% fee is high, but the buyers pay shipping and Posh provides the seller a label for every sale. Buyers don't seem to mind paying Posh's modest shipping. I am seeing very good sales there. The drawback is a lot of low ball offers but I never go lower than I am willing to go. It is a business. It is all worth it because Poshmark is not all up in my business. They leave me alone. If you sell there you must be an active sharer. It is very social. Don't expect to make a lot of sales there if you aren't actively sharing and building your followers base. "Why not complain about the rest of the sites that charge a fee on shipping? " So ....... exactly WHOS FAULT is it that eBay cant figure out a better business model then to steal from sellers for doing nothing? Why not just charge to list your items? THATS a pattern - charging people for doing nothing - and then on top of it - condoning theft from buyers, VERO attacking people and more. Same attitude/behavior - steal as much as you can from people because you know they cant do anything about it. But yeh - just add a small amount to your sell price and be done with it. Actually Ebay does negotiate with USPS for better rates and usually gets them, they just no longer pass all the gains on to the sellers, but keep it for themselves to help show growth and profits. This has been the case since that announcement from The Grifter that Ebay had spent 3 days behind closed doors with USPS in negotiations and their pricing was actually higher than everybody else for a couple of months when they finally met the $.06 FCP 1-4 ounce pricing difference with the old "You spoke and we listened". Ebay had actually lost so much revenue to sellers changing sites for shipping that they had to make the change. So i guess we did speak, but with our money that they lost because of their greed. They also NEVER did refund that overcharged $.06 per package that they had collected from the sellers while they "Waited on Clarification" as to the actual error being a fact. Postage revenue is a large revenue stream for them and one that they do not have to disclose to sellers, they just don't bother to pass it on to them. Ebay has become the best their is at squeezing blood out of the turnips, but eventually they are going to kill all the turnips. I can't wait to see the new pricing that China gets as soon as our withdrawal from the Universal Postal Union is completed and they suddenly get to pay $10 to ship their Epackets to the US. The other countries are still in it so they will probably shift their goods to other countries where the shipping is still cheap due to Chinas influence with the Universal Postal Union. There are things this person states in the YT video that is incorrect and some things misleading. Some is true and some is not. Not sure why anyone would hold this person out to be an expert on the subject unless it is just that they are parroting things that support the opinion that Ebay is some evil entity. It also represents that Ebay is somehow doing something wrong because they want to grow their sales and/or bottom line. So if that is a correct statement, which has been said here before as well, then many companies, to include us sellers that want to grow our business and/or increase our profits are doing something that is wrong. Really? I don't agree with everything Ebay does and I have some issues with Ebay that I object to strongly. But they are a for profit business that I choose to do business with. We each make our choices of what, where and how we want to sell. The chinese are well aware of the impending postal rate hike. In fact chinese drop shippers have a very large warehouse in Dayton New Jersey they ship out of. The listing stated "Sold & Shipped" from the USA! I was expecting an ePacket but got a 1st class package from Dayton New Jersey. . . .
please stop being right all the time - it leaves nothing else for the rest of us to do ! As for raising prices or charging shipping. Lets say a 4GB stick of memory sells for $25 on ebay with shipping included. Are you saying that i can charge $25 + $3.50 shipping and the buyer will actually pay it? Or do i have to charge $21.50 + $3.50 shipping. If thats the case, its really zero sum, and have to go through more effort to figure out shipping costs for all my items in the less than 1% chance that one buyer will buy multiple different items from me. Also, if i include shipping, and the buyer buys 8 sticks from me, i get $200, rather than discounting shipping about $20, or looking like i'm ripping off the buyer charging $28 to ship it when im only paying about $5. Also, i sell a lot of items, that take months, years or even never to sell. Maybe i bought something because the exact item sold 2 weeks ago for $175, no other listings for it. So i list it for $200, free shipping. Drop it $20/month til its $100, $10/mo until it hits $30, and $5/mo until it hits $15. The throw it out as unsellable.can i raise prices on it? Unlikely. Sometimes i make huge profit, other times a small loss since i pay very little for items like that. Will the price ever recover. Pretty low chance. Am i willing to hold on to it for 10 years to sell it? Depends on the size and what it is, but mostly, no. 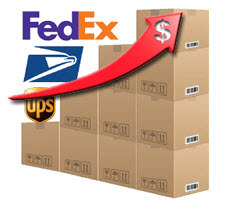 Whenever shipping costs increase due to carrier increases it is ALWAYS a learning curve for buyers. At first it is hard when we have to raise our prices to accommodate the increase costs. But it eventually levels out for buyers once they realize it is everywhere, not just with Ebay sellers. The problem you describe in your first paragraph is something that is NOT new to this upcoming USPS increase in rates later next month. But if you sell on Ebay, there is tool called Volume Pricing that you may find very handy. Or you can use stated shipping with a decreased amount for shipping additional items. As far as your second paragraph. It think that is a bit of an exaggeration. "FYI they don't get use to it, they simply use Google to find the best prices,"
Since probably 95% of what I sell ships as a First Class Package, the new tiered pricing is going to be a nightmare. I'll have to do what I do with Priority Mail, and set the postage costs to the farthest zone, and then refund the overage to all the buyers who are closer to me. I realize the USPS is going to raise their rates every year, but I don't know why they thought this was a good idea, since online sellers have no idea what the buyers' locations will be. The USPS could care less about on line sellers. All they know is it cost more to ship an item 1000 miles compared to 100 miles. I'm surprised it took this long for the USPS to go to zone shipping for 1st class packages. . . The problem with your method is that we sell more than 100 items a day. We don't have the time nor do we have the energy to be refunding all day long. It was easier to just add 1.00 to the asking price of everything and then ship it free. Problem solved. Toy collectors on eBay can't afford to buy anything but ePacket so the postal hike is moot for me. I just bought a Hornady Bullet Comparator on eBay it was the cheapest on the internet. Now I need a Hornady C1000 Gauge, it looks like eBay is once again the cheapest place to buy it. . . .
Amazon's price is $5 higher then eBay's!